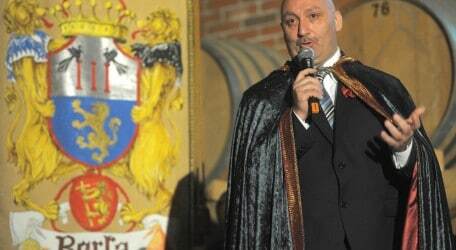 Vini e Capricci owner Abraham Said has been inducted as a Cavaliere della Corporazione degli Acquavitieri Italiani (Knight of the Italian Distillers Corporation) of the region of Asti, Italy. They kept the date and arrived a day before. On the morning of the event they went to the distillery and asked about the dress code and what the event was all about. The owner, Gianfranco Berta, who is the Grand Master of the Corporazione degli Acquavitieri Italiani, was not there but his brother, Chicco, did not give much away and just told them to be there at 5 p.m. The only indication Mr Said had was a request a few weeks back for his CV. Gianfranco wanted to know more about his business and his general background, he was told, although Gianfranco had attended the opening of Vini e Capricci in Xewkija in person last October. “When we arrived at 4.50 p.m., I immediately realised that the event was something far superior to what I was expecting. I started seeing certain cars stopping, all with drivers, and on our way in when we gave our names, the girl at reception stuck a rosette on my lapel. When I asked her what it was, she said: ‘You are one of the award winners tonight.’” Mr Said explained. Hails from the island of Gozo, Malta. He became involved in distribution and catering in 1994, after having run his mother’s food store for several years. In 2013 he opened Vini e Capricci and with it a new philosophy: teaching the art of drinking. Themed evenings, educational events, tours – all to teach the client how to taste, recognise the new product and serve it in the appropriate glass, to enjoy a perfect combination of cooking, art, wine and grappa. In his address before inducting Mr Said as a Cavaliere della Corporazione degli Acquavitieri Italiani Gianfranco Berti said: “You come from Malta, but more than from Malta, from a small island in the Mediterranean, Gozo, of which you are an ambassador. Gozo is a little known island but it is not for this reason that it is a fascinating island. It is not solely an island that attracts tourists but it is a true island. In his reply Mr Said, who was highly moved, said he had not expected to be honoured in this way. “I am glad that, in the short time you spent in Gozo, you appreciated the beauty of the island and its surroundings, and also the work that we do at Vini e Capricci, even though the outlet is very small,” he said. The other recipients of this honour were: journalist, broadcaster and writer Antonio Preziosi; jockey Giovanni Atzeni; businessman and entrepreneur Giuseppe Minna; three-star Michelin chef Kunio Tokuoka from Osaka, Japan; lighting specialist Triom SpA managing director and wine connoisseur Alessio Caputo; marketing strategy professor Fabrizio Mosca; Vicenza Confederation of Artisans president Agostino Bonomo; Italy in the World Association president Franco Quaglia; oncologist and surgeon Alberto Costa; radiotherapist Umberto Ricardi; civil lawyer and author Andrea Marcinkiewicz; broadcast journalist Debora Rosciani; agriculture journalist Paolo Massobrio; industrial relations expert Francesco Monticelli; sports broadcaster Pierluigi Pardo; and lawyer, sports broadcaster and Juventus aficionado Massimo Zampini. The evening then continued on the terrace above the cellars where they served an aperitif, followed by a gala dinner in the distillery’s museum. Among the guests were personalities known in the Italian media, Italian journalists and personalities from the world of sport – in fact, the association’s members are all people connected to gastronomy, sport, journalism and culture.